The General Motors 60° V6 engine family is a series of 60° V6 engines which were produced for both longitudinal and transverse applications. All of these engines are 12-valve cam-in-block or overhead valve engines, except for the LQ1; which uses 24 valves driven by dual overhead cams, instead. These engines vary in displacement between 2.5 and 3.4 litres (2,490 and 3,350 cc) and have a cast-iron block and either cast-iron or aluminum heads. Production of these engines began in 1980 and ended in 2005 in the U.S., with production continued in China until 2010. This engine family was the basis for the GM High Value engine family. 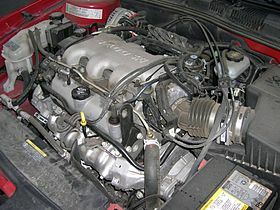 Some refer to these engines as X engines due to first usage in the X-body cars. This engine is in no way related to the GMC V6 engine that was designed for commercial vehicle usage. The transverse engines began the 60° family in 1980. Like the rest of the Generation I engines, they were updated in 1985 with larger main journals for durability, along with multi-point fuel injection or E2SE carb and OBD I. Production of the Generation I transverse engines ended in 1986. The 2.8 L (2,837 cc) LE2 was the first version of the 60° engine. It was a transverse version produced from 1980 through 1986 for the A-body and X-body cars. The standard ("X-code") engine for this line, it used a two-barrel carburetor. Output was 115 hp (86 kW) for 1980 and '81 112 hp (84 kW) for 1982-86 and 135 lb⋅ft (183 N⋅m). Bore was 89 mm (3.5 in) and stroke was 76 mm (2.99 in). Introduced in 1981, the 2.8 L (2,837 cc) LH7 was a High Output ("Z-code") version of the LE2 for the higher-performance X-cars like the Chevrolet Citation X-11 and higher-performance A-cars like the Pontiac 6000 STE. It still used a two-barrel carburetor and produced 135 hp (101 kW) and 165 lb⋅ft (224 N⋅m) for 1981 and 145 lb⋅ft (197 N⋅m) for 1982-1984 versions. The LH7 was replaced after 1984 with the MFI L44. The L44 was produced from 1985 to 1988, replacing the LH7. It was the first transverse 2.8 L (2,837 cc) to use multiport fuel injection, and was a High Output ("9-code") engine option for the higher performance A-cars, X-cars, and Pontiac Fiero. This engine produced 140 hp (104 kW) at 5200 rpm and 170 lb⋅ft (230 N⋅m) of torque at 3600 rpm. This engine's camshaft and cylinder heads were later reused in the L32 3.4 L (3,350 cc).4-L engine. The LB6 engine was introduced in 1985 to replace the original LE2. It used multiport fuel injection and produced 130 hp (97 kW). The LG6 ("D-code") was produced from 1990 to 1996 in both transverse and longitudinal applications. It used throttle-body fuel injection and iron heads. It produced 120 hp (89 kW) and 170 lb⋅ft (230 N⋅m). The longitudinal versions had minor differences from the transverse engines on which they were based. This group appeared in 1982 with the LC1 and LR2 and never added the aluminum heads of the Generation II engines. Like the rest of the family, larger journals appeared in 1985, along with multiport fuel injection for the F-body LB8 version. TBI was added for the truck version in 1986. A 3.1 L (3,135 cc) version was added in 1990 with an 8 mm (0.3 in) longer stroke, and a 3.4 L (3,350 cc) appeared for 1993 with a 92 mm (3.6 in) bore and SFI. Production of the 2.8 and 3.1 L (2,837 and 3,135 cc) (Isuzu) engines ended in 1994. Production ended for all longitudinal 60° V6s in 1996, though GM's performance-parts division continued production of a related crate engine after 1999. The longitudinal LC1 was produced from 1982 to 1984. It was a 2-barrel High Output ("1-code") version for the F-body cars. Output was 102 hp (76 kW) and 145 lb⋅ft (197 N⋅m). It was replaced by the LB8 for 1985. The longitudinal LR2 was a truck version ("B-code") produced from 1982 to 1990. It used a two-barrel carburetor and produced 115 hp (86 kW) and 150 lb⋅ft (203 N⋅m). The longitudinal LL1 was a high-output version of the LC1 produced in 1983 and 1984. It was an optional ("L-code") engine on the Pontiac Firebird with 125 hp (93 kW). It was used in the 1983–1984 Pontiac Firebird. The LB8 ("S-code") replaced the LC1 in 1985 and was produced until 1989. It used multiport fuel injection and was made for longitudinal mounting. Output was 135 hp (101 kW) and 165 lb⋅ft (224 N⋅m). The LH0 as used in the rear-wheel drive applications differed significantly from that used in front-wheel drive applications. The latter still retains the generation-I architecture block and heads. Output was 140 hp (104 kW) and 180 lb⋅ft (244 N⋅m). The power rating of the 3.4 L (3,350 cc) L32 ("S-code") used in the Camaro and Firebird was 160 hp (119 kW) at 4,600 rpm and 200 lb⋅ft (271 N⋅m) torque at 3600 rpm. The F-body cars used the Generation I architecture, with iron heads, and without splayed valves. The second generation, still 2.8 litres (2,837 cc), was introduced in 1987. It used aluminum heads with splayed valves and an aluminum front cover. It was produced exclusively for transverse, front-wheel drive use. The next year, Chevrolet introduced a full-production long-stroke 3.1 L; 191.3 cu in (3,135 cc) version in the Pontiac 6000 STE AWD, due to an 89 mm (3.5 in) bore and 84 mm (3.31 in) stroke compared to the 2.8 which shared the same bore, however with a 76 mm (2.99 in) in stroke. It was produced simultaneously with the 2.8 L (2,837 cc) in various compact and midsized vehicles until 1990, when the 2.8 L (2,837 cc) was dropped. MPFI was used on both, and a full-production turbo version was available on the 3.1 L (3,135 cc). 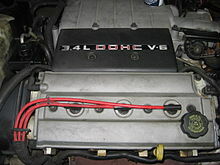 An even higher displacement DOHC 3.4 L (3,350 cc) LQ1 was also developed, and eventually, the new GM High Value engine family followed. Production of OHV Generation II engines ended in 1994 after the introduction of the Generation III in 1993. The LH0 ("T-code") was introduced in 1988 on the Pontiac 6000 STE AWD. It featured a more exotic (for the time) multiport fuel injection. While not known for its high-rpm power, the LH0 has strong low- and mid-range torque. It was produced until 1994 (1996 for the Mexican market) and was exported in some models. This engine produced 135 hp (101 kW) and 180 lb⋅ft (244 N⋅m) of torque from 1988–1989, then upgraded to 140 hp (104 kW) at 4800 rpm and 185 lb⋅ft (251 N⋅m) of torque at 3600 rpm. The L64 ("W-code") was introduced in 1991 as flexible-fuel version of the 3.1 L (3,135 cc). The two versions were one that could run M85 and one that could run E85. The LG5 ("V-code") was a special 3.1 L (3,135 cc) turbocharged engine produced with McLaren for just two years, 1989 and 1990. It featured the same multiport fuel injection intake manifolds and throttle body as the LH0, but cranked out 205 hp (153 kW) at 5200 rpm and 225 lb⋅ft (305 N⋅m) of torque at 2100 rpm. Around 3,700 engines were produced each year. This engine had a block with more nickel content and hardened internals. This engine is notable, along with other GM turbo engines of the era (such as that found in the Typhoon/Syclone), for the ease with which significant performance gains can be realized with relatively simple modifications. The LQ1 (also called the Twin Dual Cam or TDC) was a 3.4 L (3,350 cc) DOHC V6 engine ("X-code") based on the aluminum-headed second generation of GM's 60° engine line, sharing a similar block with its pushrod cousins, the 3.1 L LH0 V6 and the then recently retired 2.8 L (2,837 cc) LB6 V6. The engine was built only for front-wheel drive applications, and was featured exclusively in the first generation of GM's W-body platform. It was built from 1991 to 1997. From 1991 to 1993, it used tuned multiport fuel injection, made 200–210 hp (149–157 kW) at 5200 rpm and 215 lb⋅ft (292 N⋅m) of torque at 4000 rpm. From 1994 to 1997, it used sequential port fuel injection, making 210 hp (157 kW) at 5200 rpm and 215 lb⋅ft (292 N⋅m) of torque at 4000 rpm. In 1996, the heads were redesigned for better flow, as well as now making the engine an interference design and adapting the engine for federally mandated OBDII emissions. Output for the 1996-1997 LQ1 is 215 hp (160 kW) and 220 lb⋅ft (298 N⋅m). It had four large valves per cylinder. The 3.4 L (3,350 cc) engine used a cogged belt to drive the four overhead camshafts and a chain to drive the intermediate shaft, which is mounted in the same slot where the camshaft would go in on any of the pushrod engines in the 60-degree family. Adapting a pushrod block for the LQ1's overhead cams was difficult, and the 60° angle made this a very tall engine. The power output for this engine was impressive during its time. However, this engine has never been well liked by auto mechanics, because important maintenance such as spark plug and timing belt changes is very troublesome, especially on later models. Spark plug changes for the three rear cylinders are thought by some to require removing the upper intake manifold when performed as directed by factory service manual, and timing belt changes have a labor rate of 5 hours as opposed to 2-3 for a typical belt-driven engine. In fact, cylinders 1, 3, and 5 spark plugs can be changed by removing the crosswise stabilizer bar from atop strut towers, and using proper socket extensions and a mirror. Timing belt procedure has been posted to You Tube with some labor-saving tips. Bore was increased to 92 mm (3.6 in), but the 3.1 L (3,135 cc) engine's 84 mm (3.31 in) stroke was retained. Only a few interchangeable parts are use between this DOHC engine and other members of the 60° family, namely the connecting rods and crankshaft. The heads and intake manifolds were redesigned for the 1996 model year, incorporating a larger throttle body and plenum area, slightly longer intake runners, cloverleaf combustion chambers, and larger "pill"-shaped exhaust ports. Camshafts and cam timing were also revised for the new, higher-rpm powerband. Optional from 1991 to 1993 was a Getrag 284 five-speed manual transaxle, which was also exclusive to the GM W platform and was available only with the LQ1; parts for the Getrag 284 are not available. The electronically controlled Hydramatic 4T60-E four-speed automatic transaxle was the alternative, used during the entire production run with the exception of the 1997 Monte Carlo Z34 and 1997 Lumina LTZ, which received the 4T65-E.
Interchange: The 1991–1993 models were multiport injection, and had a single crank sensor for computer timing. The 1994-1995 models used the same long block, but had different cam carriers and timing cover. The 1996–1997 models used a modified version of the same short block and had different heads. Due to the lack of sensors needed for the newer computer systems, the '91-'93 motors cannot be used in later models. The third generation of the 60° engine was introduced in the 1993 Oldsmobile Cutlass Supreme. Like its predecessors, it continued to use an overhead valve configuration with two valves per cylinder, a cast-iron cylinder block, aluminum cylinder heads, and an aluminum intake manifold. However, the heads and intake manifold were redesigned for better air flow, the cylinder block was stiffened, and the flat-tappets of the generation I and II engines were replaced with roller tappets. This generation also came standard with sequential multiport fuel injection and structural oil pan. From the mid-1990s to 2003, these engines had failure-prone intake manifold gaskets, which could cause coolant leakage often leading to engine failure. In 2002, a technical service bulletin (TSB - #02-06-01-014) was issued to recommend RTV sealant applied during gasket replacement. Another TSB was issued to change the design of replacement gaskets intended to remedy deterioration of the nylon/silicone material of the original gasket. Tell-tale signs of such eventual related damage are a white foam that appears on the inside of the oil filler cap and the gradually increasing loss of antifreeze coolant (due to seepage into the intake passages, which will lead to engine lock-up failure in such cases). External seepage is also found near the valley edge of the lower intake manifold. These engines are also known for problematic EGR valves in which carbon build-up occurs very rapidly, therefore reducing gas mileage drastically, but without affecting the reliability of the engine. The LG8 ("J-code") was an updated version of the engine that displaced 3.1 L (3,135 cc). It still had an iron block and two-valve pushrod aluminum heads and full sequential port fuel injection. The LG8 also featured a new intake manifold and numerous changes to improve parts-sharing with the larger-displacement LA1 3400. Emissions were improved with secondary air injection and it earned LEV status. The engine featured a 89 mm (3.5 in) bore and a 84 mm (3.31 in) stroke and a 9.6:1 compression ratio. It produced 170–175 hp (127–130 kW) and 190–195 lb⋅ft (258–264 N⋅m). The LG8 was built in Ramos Arizpe, Coahuila, Mexico and Tonawanda, New York. The LA1 or 3400 ("E-code") was a larger-bore version of the L82 (note that an L82 cannot be bored out to match the 3.4). It was first used on the 1996 U-platform minivans. It displaces 3,350 cc (3.4 L; 204.4 cu in) and has 92 mm × 84 mm (3.62 in × 3.31 in) bore and stroke with a 9.5:1 compression ratio. Emissions are controlled via a catalytic converter and exhaust gas recirculation; however, the Pontiac Aztek and Buick Rendezvous do not use the latter. Fuel shut-off is at 6000 rpm. Starting around 2000, most vehicles are equipped with GM's Engine Oil Life Monitor. This engine was assembled at both Tonawanda engine and the Mexican Ramos Arizpe engine plant. Production of the 60° family began in China with the success of the Buick marque there. Importation of Chinese-built engines to the United States began in 2004 with the LNJ found in the Chevrolet Equinox. The LB8 is General Motors' base V6 in China. It is a derivative of the LG8 with the same 89 mm (3.5 in) bore and a shorter 66.7 mm (2.6 in) stroke for 2.5 L (2,490 cc). It is still an iron block with pushrods and an aluminum two-valve head. Power is 145 hp (108 kW) and 155 lb⋅ft (210 N⋅m). It is built by Shanghai GM in Shanghai, China. The LW9 is a larger version of the LB8 with an 80 mm (3.1 in) stroke for 3.0 L (2,986 cc). Power is 170 hp (127 kW) and torque is 185 lb⋅ft (251 N⋅m). The 3.4 L; 204.4 cu in (3,350 cc) modified version of the normal 3400 engine. It includes a modified intake manifold, oil pan, engine cover, and fuel system, as well as electronic throttle control. It is built in China and imported to Canada for use in the Chevrolet Equinox and Pontiac Torrent. The LNJ makes 185 hp (138 kW) and 210 lb⋅ft (285 N⋅m). ^ Hyden, David (November 25, 1990). "`Flexible-fuel` Lumina Goes For Real-world Test". Chicago Tribune. Retrieved 27 September 2013. ^ "Cars On Alcohol, Part 1: M85 Methanol Emerges". Green Car Journal Editors. greencar.com. Archived from the original on 2 October 2013. Retrieved 27 September 2013. ^ "Cars On Alcohol, Part 13: GM Supports FlexFuel". Green Car Journal Editors. greencar.com. 2007-10-13. Archived from the original on 2 October 2013. Retrieved 27 September 2013. ^ a b c d e f g h i j "GM Powertrain Car Engines 2005". Media.gm.com. Archived from the original on March 25, 2008. Retrieved March 5, 2014. ^ "GM Media Online: Pontiac". Media.gm.com. 2007-08-01. Archived from the original on October 9, 2008. Retrieved 2009-06-19. Wikimedia Commons has media related to General Motors 60° V6 engine.